LILLE, France — Jo-Wilfried Tsonga is doubtful for the remainder of the Davis Cup final after apparently injuring his groin during his loss to Marin Cilic on Friday. The Frenchman was hurt in the third set of his 6-3, 7-5, 6-4 defeat to Croatia's top player. Croatia leads 2-0 after the opening singles and could win its second Davis Cup crown on Saturday in the doubles. 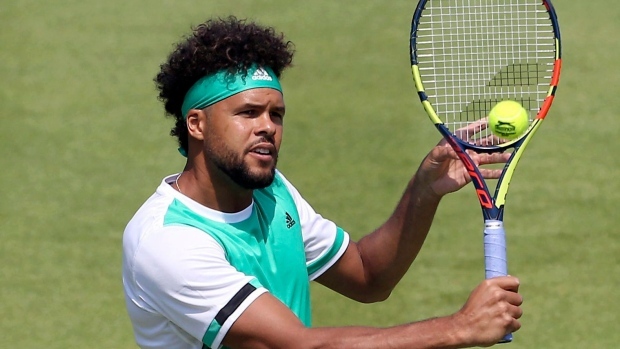 Tsonga said he will undergo exams on Saturday morning that will determine whether he is capable of playing on Sunday in case France extends the tie to the reverse singles. He said he was advised by team doctors to consider retiring against Cilic after taking a break in the third set to receive a medical treatment. "It was impossible for me, with 25,000 spectators in the stadium and many more people in front of their TV sets," Tsonga said. "I wanted to fight until the end." The injury-prone Tsonga has already missed seven months of this season because of a knee injury. He was selected for the Davis Cup by France captain Yannick Noah despite playing just four tournaments and wining only one match since September. Four years ago, Tsonga played in the Davis Cup final loss to Switzerland despite an arm injury. He lost the opening match to Stan Wawrinka then withdrew from the rest of the final. "I've had injuries throughout my career," the 33-year-old Tsonga said. "I'd like to know the reasons and wipe off all these physical problems. Today, I haven't got any certainty but I will do my best to be competitive on Sunday."